On March 7, 2019, Livio Weng, CEO of Huobi Global, announcedthat Huobi Global will officially launch “HuobiPrime”, then HT （Huobi Token）surges. 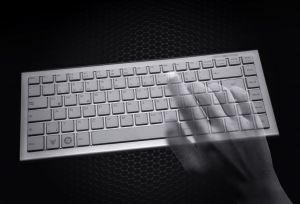 It is claimed that Huobi Prime is designed by Huobi Group'sCEO and founder Leon Li. The popularity of Huobi Prime hailed as the potential savvy tactical success for Huobi Global. However, a hidden crisis breaks out. On September 4th,2017, China’s central bank together with six other departments released a public statement on regulatory policies and warned of the risks of ICO projects. The announcement requires all kinds of fundraising activities through token issuance should stop immediately. Inaddition, Organizations and individuals who have completed token fundraisingpreviously shall make arrangements such as refunding crypto assets to investorsto protect investor rights and to deal with the risks properly. At that time, most cryptocurrency exchanges seek to migratetheir exchange business Overseas to survive. Beijing-based crypto exchange Huobi China failed to avoid the storm. It officially released an announcement on September 15, 2017, thatit would halt trading for local customers. But following that it also releasesa notice to remind customers to move to Huobi Global using their original account. Huobi Global has continued to vigorously pursue overseasexpansion, launching a South Korean subsidiary in April to complement existingoperations in Hong Kong and Japan. In 2018, Huobi also launched an Australiancrypto trading platform, opened an office in London, and acquired controlling stock interest in a Hong Kong Stock Exchange-listed firm, as well as JapaneseFSA-licensed crypto exchange BitTrade. However, several resources surfaced that most Huobi overseas subsidiaries that didn't seem to launch. Moreover, Huobi Global a namely Singapore-based crypto exchange now is transferring its Singapore offices, selling furniture onlineand likely to go bankrupt. Huobi Global Limited is a company registered and establishedin the Republic of Seychelles, an its headquartered is in Singapore, rather than Beijing orHainan Tsingmai. Hongxin Sun, a related person told CaijingOnchain, the headquarter not only operated Huobi Global, but also was responsible for listing new programs and handled overseas PR. The headquarter has a workforceof 80 employees in its heyday. Several sources surfaced that Huobi’s plan is to move itsdomestic headquarters to the Haikou pilot zone. Its listing and overseas PR areoperating in Hainan province. Now the headquarter has a workforce declining to less than10 employees, and its CEO Livio Weng always residents in Beijing. CaijingOnchain found that at least six letting agents start to advertise renting an office in Asia Square Tower 1. In fact, HuobiSingapore has its registered office at TECHCHAIN PET.LTD. where the sameaddress of renting one. Hongxin Sun told CaijingOnchain that TECHCHAIN PET.LTD. is the registering entity, which never released by any news. Huobi Global Facebook，meetup，eventbrite show that from November 2018, Huobi held at least six meetups and events in Asia Square.Singapore limited who focus on marketing said that this office also for rent,about 1500 Singapore dollars per three hours. This office is about 1400 sqm, which is affordable for 120people. New renters could enjoy a range of supporting services and benefits including featuring ergonomic furniture. The price is 187500 Singapore dollars(about 900000 CNY). Business profile of TECHCHAINPET.LTD. shows that Huobi rent the office from April 12th, 2018. 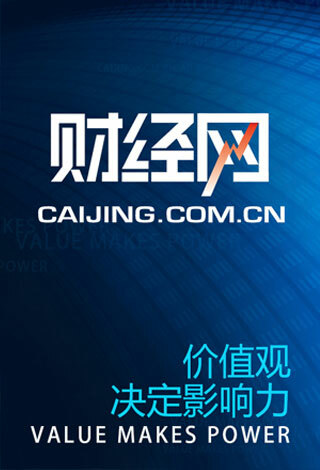 A related person told CaijingOnchain that the tenancy agreement is for three years. The rent is 230000 Singapore dollars per month(about 1.1104 million CNY). It takes 20 million for decorating. On March 13th, 2019, Huobi Singapore staffs are sellingtheir furniture on Wechat. The remaining employees have already moved to a new place,and no one knows where it is, the trigger was that letting too expensive to afford. Singapore related law requires a company’s registered agent maintain a physical mailing address in the state where the company (or LLC) isregistered. In addition, even if there is a new tenant takes over the office,TECHCHAIN PET.LTD. still needs to pay the difference between the two leases until the expiration, and an additional six-months liquidated damages, damages that the landlord, in this case, suffers because tenant terminated the leasebefore it expired. It is said that TECHCHAIN PET.LTD. is filing a businessbankruptcy to avoid paying expensive rent, and may register a new company. The statutory minimum for Bankruptcyapplication pursuant to the Bankruptcy Act (Cap 20) is S$15,000 (About72000CNY). 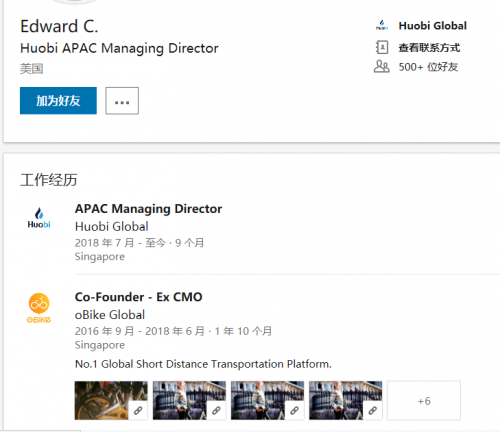 Linkedin shows that the Director of Huobi Global (Singapore)is Edward Chan, who is Huobi APAC Managing Director. Edward Chen was co-founder and Ex CMO of oBike. oBike was a Singapore-registered stationless bicycle-sharing system started by businessmen Shi Yi and Edward Chen with operations in several countries. It launched in Singapore in February 2017 and ceased operation on 25June 2018 in Singapore. oBike raised $45m series B round. oBike announced that it had over 1 million users. Users need to hand S$49 deposit each to bike, (about 235 CNY), and S$19 for students(about 85.5 CNY), the bicycle-sharing company oBike hire is $2/60 minutes. On 25 June 2018, oBike announced that they were exiting theSingaporean market as they are unable to meet new legislation addressing indiscriminate parking of bikes. Hundreds of oBike customers in Singapore and Australia have complained that the company is refusing to refund deposits and is uncontactable. At the beginning of 2018 oBike entered into a partnership with TRON. In addition, customers of oBike can use the app to pay with the Cryptocurrency ″oCoin″ in future. 20th February 2018, Tron’sfounder Justin Sun is touting for oCoin on Youtube. The oCoin is listing onGate.IO, HuobiPro, Bit-Z、Kucoin.oCoin had raised 400 million CNY in an initial coin offering (ICO). They are currently under investigation for fraud by theSingapore Police Force. oCoin declines dramatically. After it withdrews from Singapore, On July 2018, Edward Chenserves as Huobi APAC Managing Director. Edward Chen met Huobi COO Jiawei Zhu inan event and two of them hit it off right away, then Edward Chen joined HuobiGlobal quickly. TECHCHAIN PET.LTD. registered information showed that it was100% controlled by Jiawei Zhu. Insolvent liquidation may not make any negative effects ondirectors. Under Singapore jurisdiction, entrepreneurs of malicious bankruptcy will not be allowed to start a new company in Singapore, whileTECHCHAIN PET.LTD.’s Actual Manager does not include in the list. In March 2019, the official ownership of the Huobi DM contract was changed to the United Kingdom, but it announced that it shouldhave been Singapore When it debuted last year. Insolvent liquidation may expose that Huobi DM contract isactually operating in Shenzhen, China, rather than Singapore. Huobi former employees reviewed the company and left a comment on Glassdoor that only working environment satisfactory. Glassdoor is a website where current and former employees anonymously review companies andtheir management. Former employees exposed on Glassdoor that Singapore is not significant for Huobi. The actual headquarter is in China. The Singapore officeis just a disposable, supporting role for Huobi to make money in the Asia Pacific, and a bragging right to claim to clients that they have solid establishment globally. As a global platform，Huobi employees are curious about that all major decisions are made by the Chinese sector, and working emails writing in Chinese. However, either Huobi contract trading or listing has no longer in Singapore headquarters, and few employees remained are too hard to operate. huobigroup.com shows that Currently, Huobi Group has invested in more than sixty upstream and downstream enterprises. It has established compliance service teams in Singapore, Japan, South Korea, UnitedKingdom, Australia, Canada, Brazil, and Hong Kong to deliver its secure and credible digital asset trading and asset management services to millions ofusers in over 130 countries. Odaily reported in December 2017 that an insider of Huobisaid that it aimed to expand fiat-crypto trading in Australia, US, Japan, andSouth Korea. However, after Huobi moved overseas for more than a year,things were not going smoothly. On 30th March 2018,Huobi South Korea was launching, and it is the first compliance service team. Leon Li stated that Huobi South Korea is an important strategic objective of development for Huobi Global. After Huobi South Korea debuted, it was hailed as thenotable milestone of global expansion to Huobi. Less than a year, Huobi established exchange services in Asia, Europe, Australia, and North America. Sun Hongxin told CaijingOnchain, Huobi South Korea has alsogone through staffing cuts, the trigger is that overseas exchange business is hard to afford the expenses. In the beginning, Huobi South Korea listed 99 tokens andcrypto cross pairs to 201. The scale is big, but the benefits cannot cover the expenses. feixiaohao.com shows that 24 hours trading volume of HuobiSouth Korea On on March 18 was $12.462 million. Since 2019, the maximum trading volume was $176.619 million. Sun Hongxin said that compared with other service teams, it is currently a better one. However, a market maker told CaijingOnchain, Huobi SouthKorea may wash trading. Sun said that other service teams are struggling, especially the Vietnam team which suffers from serious staffing cuts. 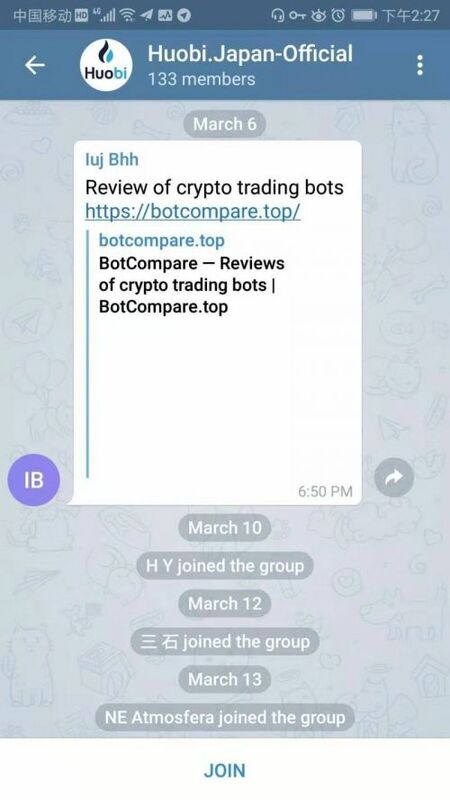 Cryptobriefing on February 11, 2019 reported that investorsfile the lawsuit against Elastos And Huobi. The investors have asked the New York Supreme Court tosummon the Elastos Foundation and team members, as well as Huobi and its US partner,HBUS, to answer their complaints, according to a leaked summons filing. Aclass-action lawsuit led by plaintiff Mark Owen claims that the Elastos ICO –which took place in 2018 – violated Section 5 of the Securities Act 1933,mandating all sales to register first with the SEC. FinCEN is clear on the fact that acting in these capacities don’t necessarily make a business a money transmitter. The bureau only goes as far as to say that doing these things “might” make a company a money services business. In addition to satisfying requirements at the federal-level,FinCEN mandates that money transmitters obtain a state license within everystate in which they maintain operations or conduct business. An insider Zheng Yu said that HBUS gained a state-levelmoney transmitter licensure, it just can maintain operations and conduct business in the state, therefore, its source of funds mainly come from HuobiGroup. Huobi Japan (BitTrade) also faces the same challenge. Since July 2018, Huobi Pro made the decision to withdraw Japan-based services because is not registered with the Financial ServicesAgency (FSA). Huobi Group announced on January 2019 that, thanks to itsmerger with BitTrade, Huobi Japan has relaunched itself as a fully regulatedexchange under Japan's Financial Services Agency (FSA). "This is an important milestone for us," said Leon Li, "Firstly, because the Japanese market is a very important one to usand, secondly because working with regulators is a longstanding priority forHuobi Group. We're proud to say that Huobi Japan now has one of the first 17 licenses issued under the FSA's ground-breaking regulatory regime." The relaunching does not look promising. Odaily reported that Huobi Group spends approximately 61million CNY to merger BitTrade. Zheng commented that Huobi Group cost a large quantity of money to merger BitTrade,but it is not worthwhile as it expects. It gets contributed from Huobi Group. Cryptocurrency investors in Japan could be tax 15 to 55percent of their cryptocurrency profits. Additionally, Huobi Japan could onlyprovide trading service for Japanese residents. CaijingOnchain found that there were only ten trading pairs on the Huobi Japan platform due to its progressive regulations. An exchange founder who seeks to launch Japan exchange told Odaily that though the Japanese government may issue a license, it does notwant Foreign Capital companies to occupy a large market share. CaijingOnchain found that there were on 133 members in Telegram group and the number of Twitter followers is about 33000. 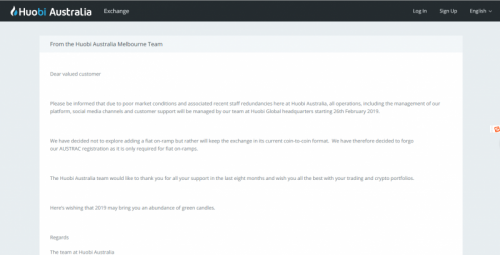 Meanwhile, Huobi Australia has announced on social mediathat its office will close as of 26th February 2019. All operations will transfer to Huobi Global headquarters in Singapore. It was the first Fiat-crypto exchange, but now just providing crypto-crypto services. Since May 2018, Huobi Group announced to establish Canada service team, but after six months, local traders said that they haven't heard much since, and curious about whether if it is still going. But after that, it has not been heard of since. Huobi confirmed the opening of its London office, but European Internet service provider and anti-virus software jointly expand their service to the website, and it can restrict access to the website. Huobi also gained a so-called Distributed Ledger Technology(DLT) license in Gibraltar, which would be debut in 2019, while until March, ithas not been launched. Huobi has announced to expanse its global strategic development spanning five continents. Either merging local exchange to beregulated or gaining state license to provide compliance service, Huobi spendsa large quantity of money. But they may not be worthwhile.